After talking my friend David into going with me to see Godspeed You! 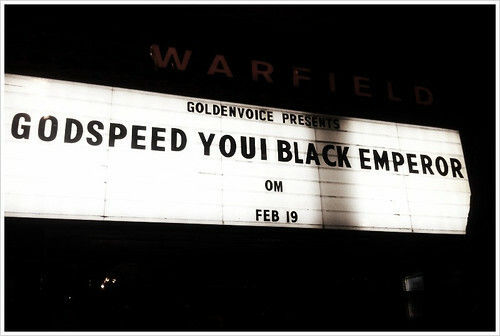 Black Emperor at the Warfield Saturday night, I found someone with extra tickets on Craigslist and we made our way downtown. The live music business might be in a slump, but you wouldn't have known it. When we arrived at The Warfield, we were surprised to find ourselves at the end of a very long line wrapping around Market Street. 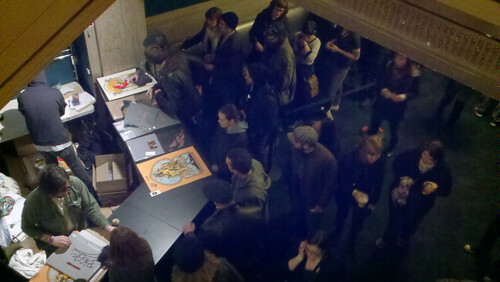 Inside there were more lines - at the merchandise table and at the bars. Already, it felt like we were at a happening, that musical memories were about to be made. 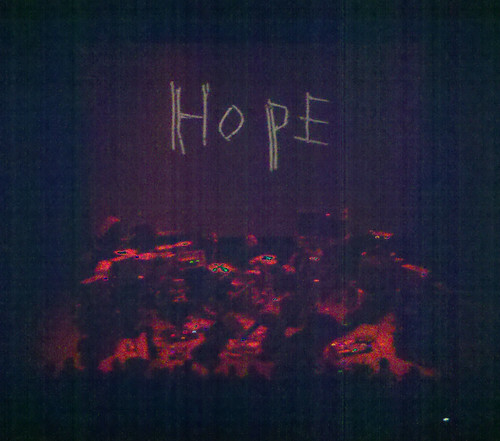 A night of majestic, epic instrumentals began with a low level drone as film projectors displayed the word "HOPE" in blinking, messy scrawl on a large screen above the stage. In the same way that Godspeed You! Black Emperor communicates their apocalypse-laden message of hope without words, words too fall short of doing their live presentation justice. A wall of amps, several guitarists, two bass players, a drummer, a percussionist and a violinist allowed the eight members on stage to explore dense sonics that varied from ear-bleeding cacophony to pin-dropping guitar segues within each 20-minute suite. You would have been hard pressed to find evidence of a seven-year absence in Godspeed's ebbing and flowing set, as they explored massive crescendos and delicate transitions with unified dynamics. Also missing were any signs that their sound was dated, with the group's shimmering but voiceless anthems translating well in the current musical climate. Suffice it to say, words don't do their music justice, so I won't bother. See for yourself.